We have finished our school Valentine's today! Hooray! 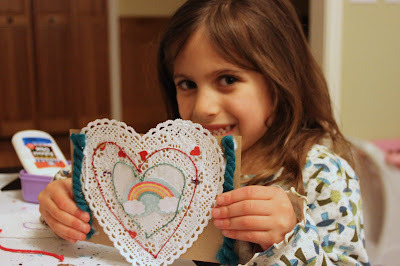 I love making homemade Valentine's with the kids. I'm not even sure they know there is anything different, but man I could certainly use a nap now. 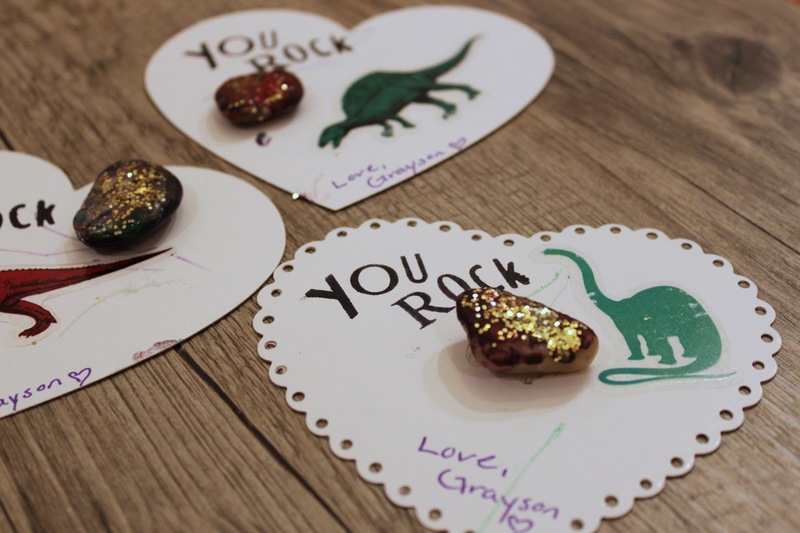 Grayson loves to create just as much as Emma and this being his first school year he was very excited to make Valentine's for his adorable little friends. We went with a rock theme since, well, my boy loves rocks. 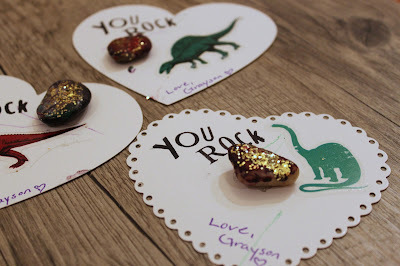 I just love how our rock dino cards came out. For more instructions head over to Kiwi Crate. I change what is on our art table seasonally. For the past couple weeks I have had a "salad bar" style Valentine making station out for the kids to create with however they wish. These are supplies we always have on hand, but for some reason when I present them in a different way they are so very exciting to Emma. She has made some really beautiful Valentine's for family and friends. 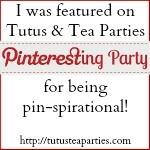 I usually get at least one a day and I love it! 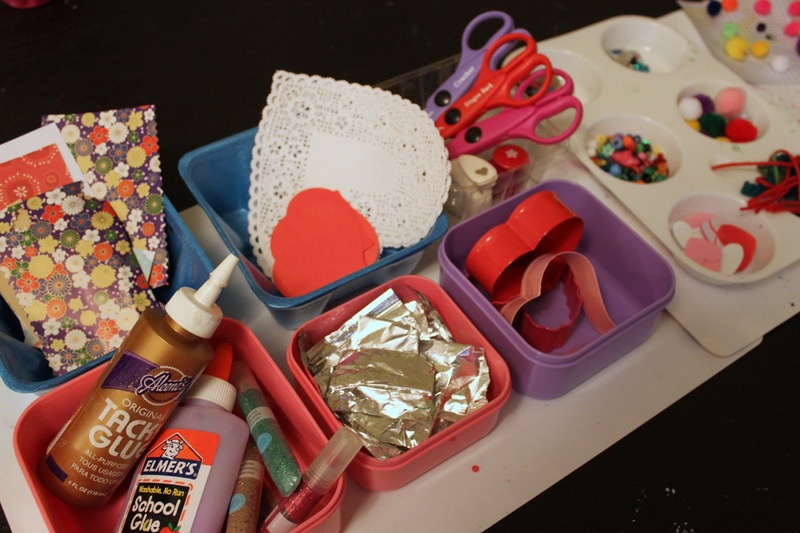 Check out my tutorial over at Kiwi Crate for more tips on making an open Valentine station for your kids. 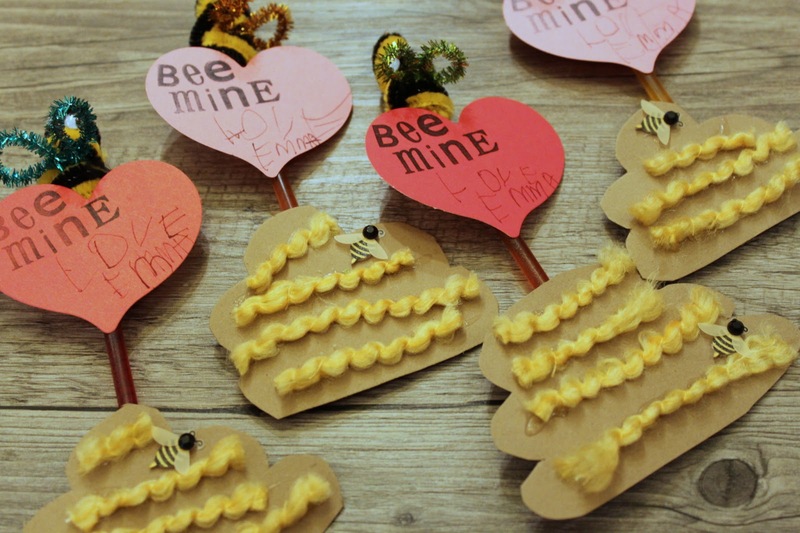 I know I shared this one with you all already, but after Emma insisted on adding a beehive we added this sweet addition to her school Valentine's. I just love the beehive, it's like it was meant to be all along. 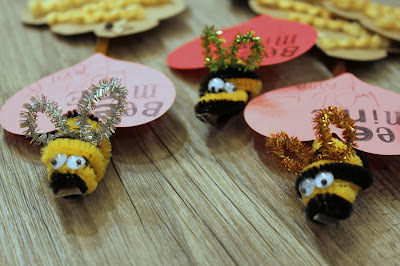 We used card stock, yarn and some cute bee stickers we found in our way too big sticker box! And I tell you just how to make those darling bees over at Kiwi Crate. 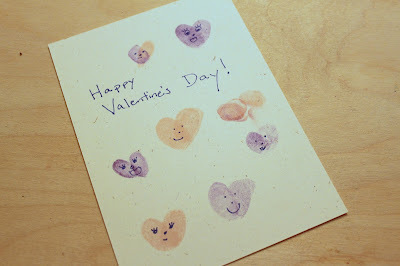 Lastly, finger print heart stamped cards are always a fun one for children to make. 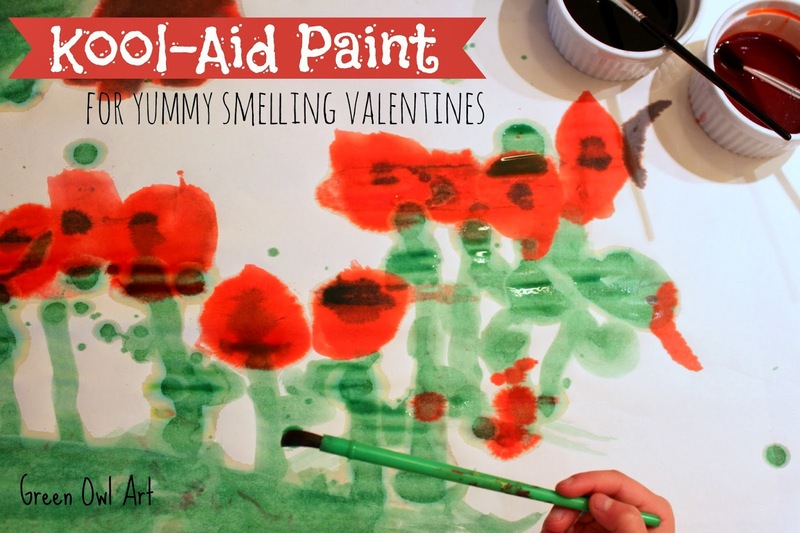 I shared this simple and fun Valentine at Kiwi Crate. 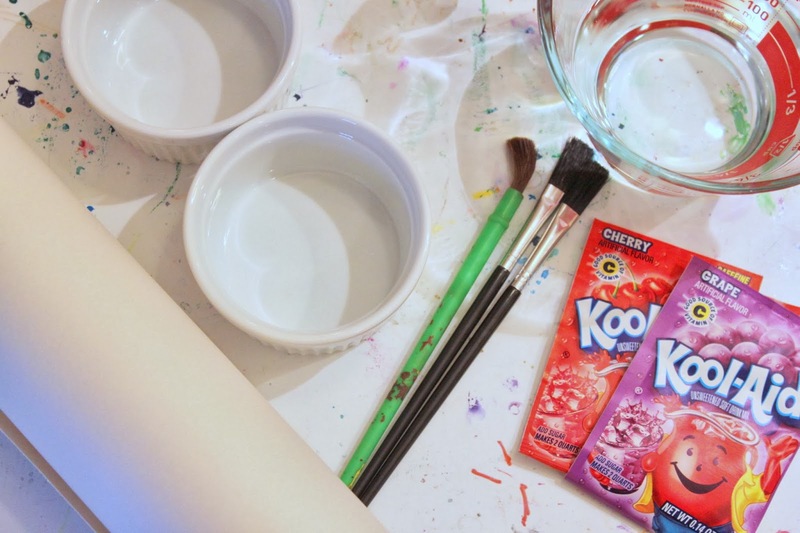 I hope you try and make some homemade cards this year. Happy Valentine's Day! 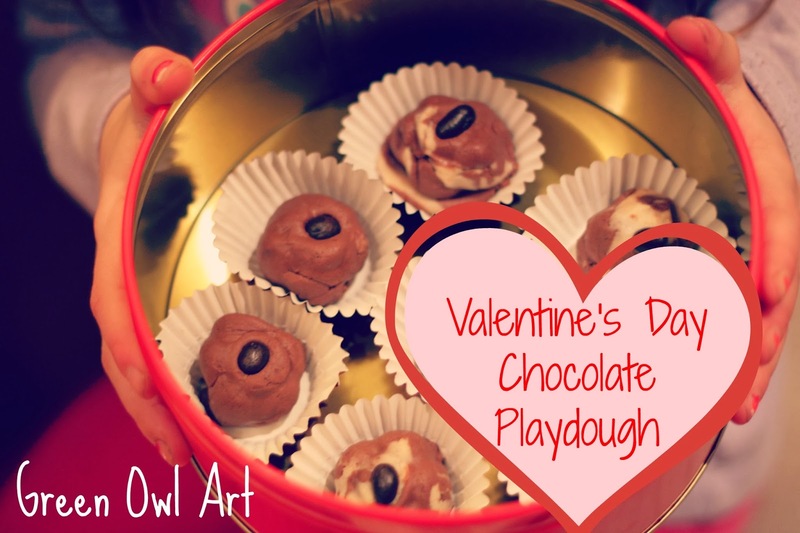 We make a large batch of chocolate play dough each year around Valentine's Day and I never thought to give the kids some goods to actually make play dough chocolates. Yep, this was Em and G who took control of this fun afternoon. With a few different ice cube molds, mini muffin cups and a heart themed tin--these kids had a full chocolate factory going in our house. 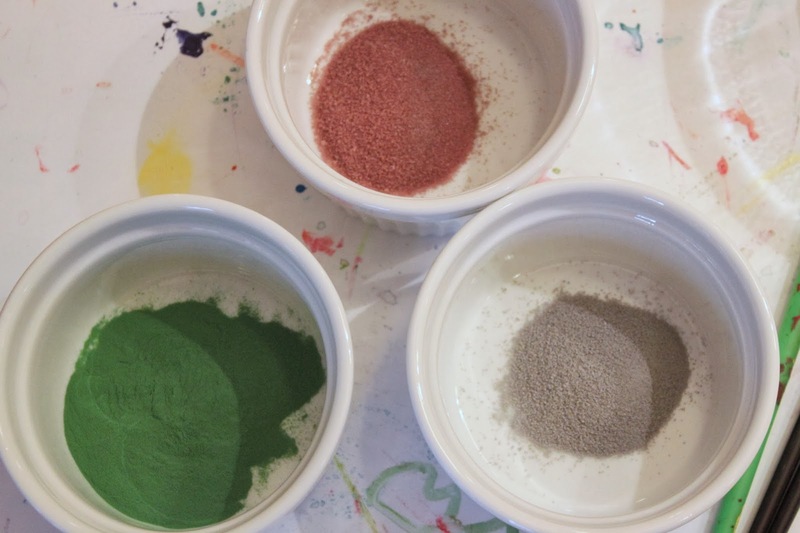 If you have not yet made chocolate playdough, check out our super simple recipe here Chocolate Playdough Recipe. 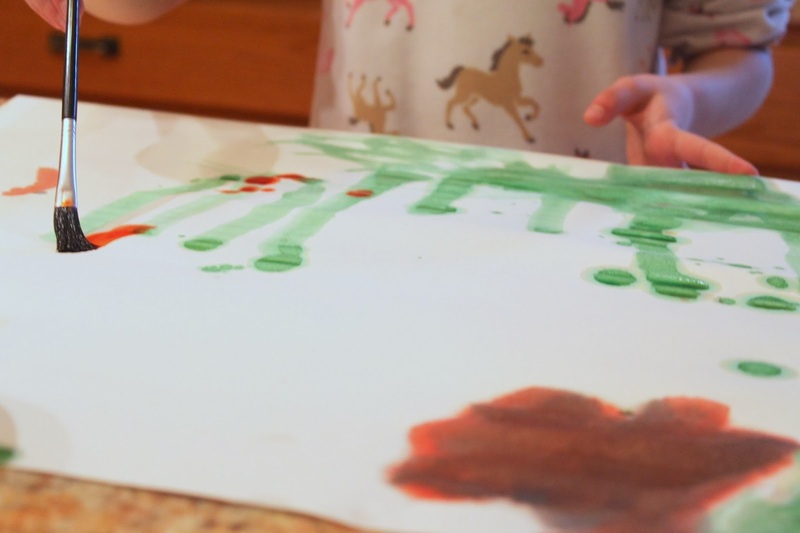 When I was brainstorming for something to use to make prints with for Valentine's Day, celery was an obvious choice. 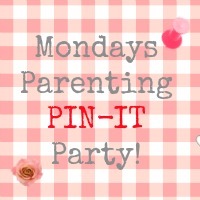 If you do not know yet, (now you do!) celery makes the most beautiful rose prints. You just use the bottom part of a celery bunch, the part you would toss into the compost, so no wasted food here. We have always made red roses, but decided to get a little crazy and throw in some purple to the mix on this day. I know, I know....we are a bit of a dare devil type family. Never know what's going to happen in this house (look out, pink snowman coming your way!) Tehe...it's early...I need coffee. 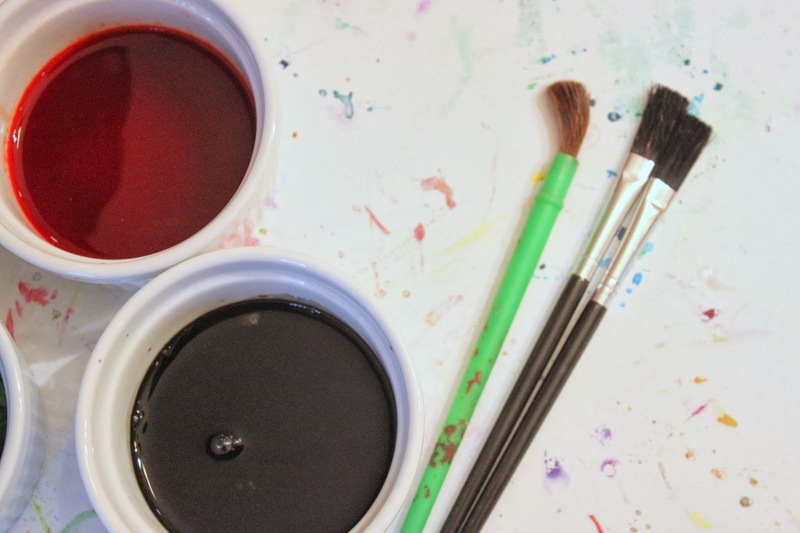 We paired our prints with oil pastels and they came out so vibrant and fun. 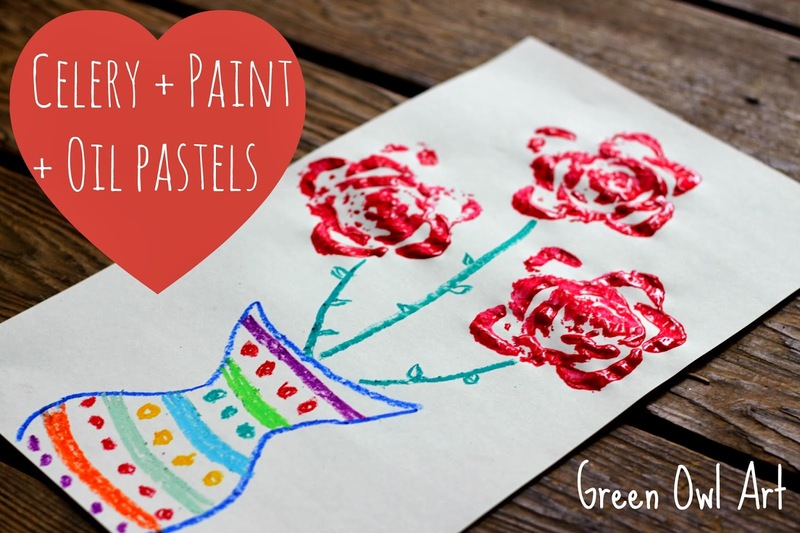 If you have not tried oil pastels with the kids yet, I highly suggest you give it a go, but of course crayons would work just fine, too. Now that I am looking at these photos I think going over this with watercolors would be fantastic! I wonder what other produce would give you a floral print. 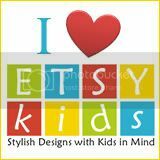 I see a spring bouquet print in my future! These are pretty self explanatory, that is why I am rambling. This fluffy pipe cleaner one was by far the cutest. I mean come on, don't you want one?? So darling. 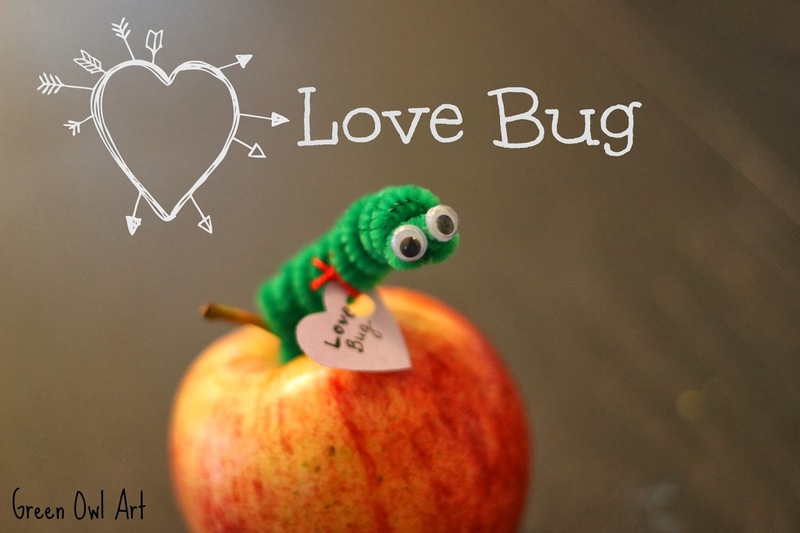 For Valentine's day we just twisted the end of the pipe cleaner onto an apple stem and added a tag that said "love bug!" Yahooo! Both kids are finished with their Valentine's!